Wool is a classic, timeless material, but it isn’t always an apparent choice for livening up an office. Here are 10 creative ways to incorporate wool felt into your office space. Baa, baa, black sheep, have you any wool? While that nursery rhyme dates back a few centuries, using wool from sheep has been around for thousands of years. People have been using wool in many ways, and wool felt is one of the best ways to add the fiber to an office setting. Wool is economical, biodegradable, and flame resistant, making it a wise choice for clothing, upholstery, and a multitude of applications for interior design. Unlike the wool you may find in objects like clothing and blankets, wool felt is a non-woven material made from sheared wool (called roving). Heat, moisture, and then agitation applied to the roving compacts the fibers together to form wool felt. Because wool has a “scaly” surface, the fibers lock together through this process to create a dense yet breathable textile. And though the idea of wool might conjure up thoughts of basic winter sweaters and itchy handmade socks, wool felt can be anything but boring and bland in the office. Take a look at a few ideas on how to bring this amazing textile into your office design. Sure, some people don’t get the need for throw pillows. However, a few well-placed wool felt throw pillows on office couches and chairs have function and flair. Pillows obviously aid in adding comfort to office furniture, but they can also add color, texture, and help with better acoustics. Soft textures absorb or diffuse sound better than hard surfaces, so pillows work on multiple levels in an office setting. Check for 100% wool felt options first, though felted wool (a woven textile made from wool roving) and woven wool materials can work well too. Adding wool felt to furniture can go beyond pillows. Office seating may lack upholstery or padding, and adding a custom-cut seat pad made from wool felt can add comfort and style. A pad as thin as 5mm, combined with a non-slip underlay, provides a more comfortable seating surface and much needed personality — especially when you consider the array of colors available for modern wool products. Furniture can also be covered in 100% Worsted EthEco® Wool made from the Sense wool felt, providing better air quality and a wide range of colors for added interest to an office space. Wool felt is seriously amazing. One of the neatest aspects is its ability to be formed into shapes without traditional techniques like sewing or gluing. Artists and designers create simple forms from wool felt like bowls that can be used on your office desk to hold small items or even pens. The material is sturdy and durable, so it makes for a perfect piece to add function and beauty. Office in need of creative and cool art? Consider an artistic work made from wool! Though not all wool artists use wool felt in their pieces, artists like Zetta Kanta use roving to handmake wool felt, felted wool, and more to create impressionistic wall hangings. You can also use handmade abstract “paintings”. Whichever style or technique you go with, wool artwork is a forward-thinking, solid choice that can add texture, color, and some sound absorption to your office. For a more industrial style, Twister Plus panels can work well in many offices to add artistic expression coupled with superior sound absorption. If you are among the millions of office workers affected by having a black thumb when it comes to keeping plants alive, a handmade wool felt arrangement of plants and flowers may be a sound investment. Aside from the added color and texture to your office, you’ll get the added benefits of relaxation, a challenge, and a sense of accomplishment in having made your very own sound-absorbing piece of décor. If your office is a bit more open and has no assigned desks or seating, look into portable privacy screens made with wool felt. Screens such as the MixMax are made in 40 colors of 3mm wool felt. These portable screens an easy way to get a little privacy during the workday while also bringing in color and texture. A similar application for wool felt in an office setting is hanging panels of wool felt. Products like the Screentrak® Soprano provide better acoustics in a room with 3mm wool felt cut into fun and interesting patterns. 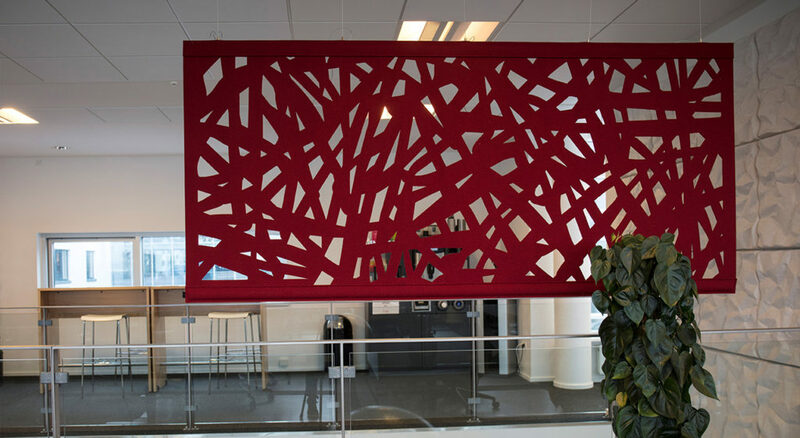 These wool felt panels can be mounted directly to a wall to help with sound absorption, or they are used to break up larger spaces via suspending panels of wool felt from the ceiling. Since the Screentrak comes in 22 patterns and 40 colors, these panels are an excellent choice for bringing in wool in creative ways. Whereas the Screentrak provides coverage for smaller areas, sometimes a full coverage installation is desired. Wool felt via the Fraser Felt line can be installed on walls or floors, giving a pop of lively color that also works to absorb sound. Another benefit of full-coverage wool felt applications is air quality. Because wool acts as a filter, it does a great job of improving the air in an office. Because it is a 100% natural material, wool felt is VOC free and biodegradable, making it a responsible choice as well. Another possibility for incorporating wool felt into an office space is with briefcases, satchels, and desk mats. Briefcases made of wool felt are warm, breathable, water and flame resistant, so the contents have protection while being encased with style. Wool felt desk mats and computer mouse pads can add fun shapes and color to your desk, like bright orange hexagons or neon pops of green squares. Handmade laptop sleeves and cases are another way to use wool felt in the office to allow personal expression. Wool may not be the first thought when it comes to curtains, but wool is an excellent insulator and air filter. Utilizing wool felt fabric like that from the Fraser Felt line with grommets can make no-sew curtains a breeze. As with other wool felt additions to an office space, wool felt curtains would provide another layer of sound absorption and diffusion for better acoustics. Since wool felt can be sewn or glued together, making a modern, geometric pattern using complementary colors could be a fun, inspiring way to incorporate wool felt into an office décor project. With so many options, where should you start? If your office is small, look at desk accessories and pillows first. For larger spaces, incorporating wool felt on a larger scale with full-coverage wall or floor applications is the best way to get more sound absorption, better air quality, and durability for the investment. However you start adding wool felt to your office, have fun and be creative with it.